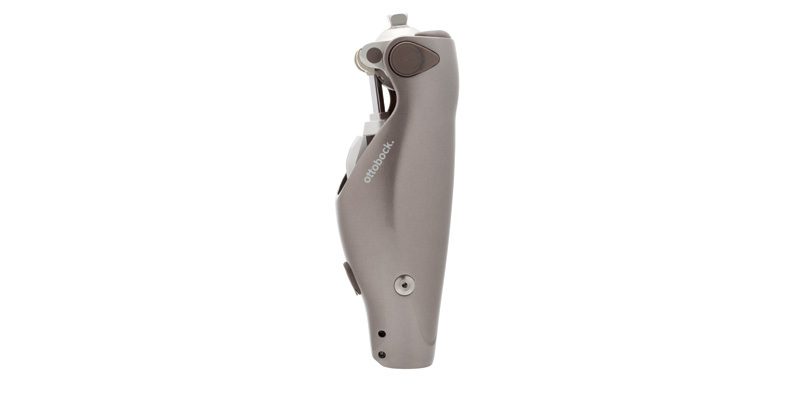 The C-Leg 4 is Ottobock’s latest improvement to its original C-Leg, which debuted in 1997. The improvements to the C-Leg 4 include advanced stumble recovery, up to three days of battery life on a single charge, a naturally-shaped frame design for more feet options, and no pylon for greater reliability. Intuitive Stance: Recognizes when movement has stopped and dampens the knee in a slightly flexed position. This makes standing more comfortable and less tiring even on uneven surfaces, ramps, and slopes. This feature adjusts and readjusts with every step in real time. Inertial Motion Unit: A control feature that improves the transition to swing phase and makes walking backwards safely possible. Changing walking speeds are controlled efficiently and effectively, even when steps are small or surfaces are challenging. 3D Motion Analysis: Sophisticated sensors determine where the prosthesis is in space at all times and makes precise adjustments at every moment of every step. New Sitting Function: Automatically switches C-Leg 4 to free-swing when the individual user sits down, resulting in a relaxed position and activation of a battery save mode. Two Additional MyModes: The knee can be set to make activities like biking, dancing, or golf easier. Switching modes is simple. Use the cockpit app for android remote control and motion pattern to quickly change settings using Bluetooth technology. Weatherproof knee: IP67 rating delivers a weatherproof knee, meaning that it can be completely submerged in one meter of fresh water for up to thirty minutes.